Alex doesn’t play video games because he lives in the forest, whole this time he watches Felix do it from the start. Like PewDiePie is a bridge from Alex to video games, this burger is a bridge from Serbia to Sweden with Best Regards from AlmazanKitchen©. This recipe looks like a very complicated and time consuming one, however it worths every minute spent! Juicy beef mince, mixed with onions, free-range egg and handful of breadcrumbs – all become real Swedish meatballs! 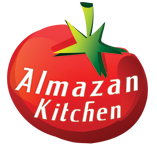 (Do you remember AlmazanKitchen’s first video ever?). We also didn’t forget about glorious cream sauce, as usually we improvised a little bit to enhance it! Almazan-Sense tells that there should be another sauce…. Yes! Berry sauce! Handful of black chokeberries, raspberries and few melissa sprigs under easy movement of the pestle become lovely berry sauce which complements whole flavor experience just how it should be! The main guest of the show is special baked buns coated in real 24K edible gold! This masterpiece is called PEWDIEPIE’S GOLDEN BURGER! Smash and mix handful of black chokeberries, raspberries and few melissa sprigs in the mortar using pestle. Mix 1-1.5 hands of flour with 1 tbsp. of butter, 1 tbsp. of yeast, 1 tbsp. of sugar, egg and 1/2 cup of water. Mix and knead well, form a ball. Coat bun with organic gold primer using brush. Grate 1 onion into the bowl with 400g of beef mince. Add 1 tsp. of salt, 1 egg and handful of breadcrumbs. Mix very well. Preheat the pan, grease with canola oil. Cook constantly flipping until golden brown texture, it should take about 5-10 minutes. Put aside meat balls for now. Add 1 tbsp. of flour into the pan, mix well with meatballs and oil leftovers. Add 2 tbsp. of beef broth. Mix well. Cook for few minutes to let it become a little bit richer. Grate some truffles, add 1 cup of cream, 1 tbsp. of worcestershire sauce and 1 tbsp. of mustard. Mix & stir well. Cook for few more minutes until rich consistency. Put meatballs back to the pan, coat each ball in the sauce. Slow cook for few minutes. Grease bottom bun with berry sauce. Add meat balls with cream sauce.